Cats love boarding at Fit N Furry! Our cat boarding guests come to Fit N Furry in Petaluma, CA from the Northern Bay area including Petaluma, San Francisco, Santa Rosa, San Rafael, Napa, and beyond. Why? Because our sunny, separated and ventilated cattery is second to none! Every cool cat at Fit 'N' Furry Pet Resort has their own custom built kitty condo in a dog-free section of our environmentally-friendly facility. They will enjoy a safe and relaxing environment. First time guests receive the First Night Free with a 2 Night Minimum Stay! Ask our Reservation Specialist for details when your book your kitty's stay. New Cat Boarding Clients get First Night Free with a 2 Night Minimum Stay! I choose Fit 'n Furry because I really liked that the place was family owned, how the facility was set-up for cats and that it was clean and well maintained. I felt like my cat would be in good hands and that this was a trustworthy place to leave my pet. Delicious and nutritious meals of Natural Balance premium cat food are served to our cat boarding guests. You are welcome to provide your cat's favorite food during your stay. Should your cat have special needs or dietary restrictions, we will provide a feeding schedule tailored to their special needs. Administering most medications is not a problem. Just let our Reservation Specialist know in advance of your cat’s stay with us. Though kitties might seem pretty independent, we know they need just as much love as dogs do at their home away from home! 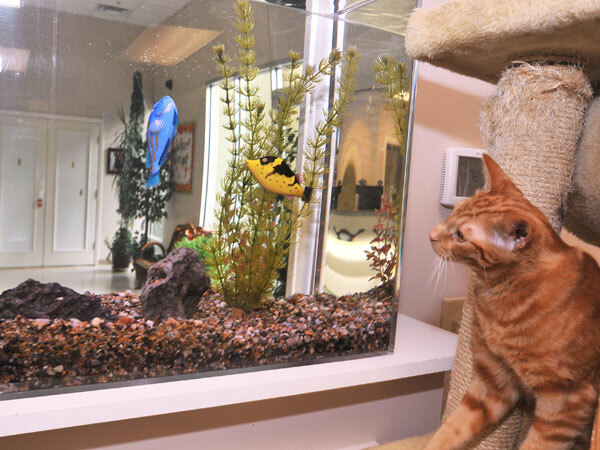 While our cattery at Fit N Furry in Petaluma, CA provides sumptuous surroundings and spacious rooms, we know that our feline guests enjoy activities too. We have personal guides to show potential guests our many amenities. Please call (707) 769-7387 to request a tour. Cats rave about individual sessions of play time devoted just to what your cat enjoys the most; playing with a toy, a game of laser tag, chasing a catnip mouse or just being cuddled by an adoring fan. You tell us what your best friend likes to do and we'll make sure they get that special time as if it were you with them. Q: Does my cat need to be spayed or neutered to spend the night? A: We ask that all our feline guests be spayed or neutered. Q: My cat requires medication. Are you able to administer medication? A: Absolutely. We have staff members qualified to administer most medications guests may need. Just be sure to let our Reservation Specialist know in advance of your cat’s stay with us. Q: What vaccinations does my cat need in order to stay at Fit ‘N’ Furry? Q: How old does my kitten need to be to stay at Fit 'N' Furry? A: Kittens must be 16 weeks of age to stay. Q: What are your requirements for the health of my kitty? A: All pets must be on an active flea and tick prevention program. All pets must be in good health and have not been ill with a communicable disease within the past 30 days prior to boarding or daycare. Q: My cat has a finicky belly. What meals do you provide? A: Guests will be served nutritious meals twice a day. You are welcome to provide your cat‘s favorite food during your stay. Should your cat have special needs or dietary restrictions, we are happy to provide a feeding schedule tailored to their special needs. Q. Can I come in for a tour? A: We welcome tours any time, in fact, we recommend it! No appointment necessary; just call and let us know!